I just finished Wisdom and began Baruch. Then I began to read the introductions to many of the books in the NAB [New American Bible]. I’ve always found the authorship of the Bible books interesting. I just read Philemon. If nothing else comes up, I may just read the entire Bible again. It will be good to read it without the blinders I had in high school. In my first reading, I was blinded by my faith. Now I can read with cynical, critical and open eyes. A bruise is still noticeable on my right arm from where my blood was drawn. The cough is still with me, but fading; fortunately, it didn’t develop into anything worse. I just read the first and second epistles attributed to John. My cellie, Gary, is visiting with his family. Since they are from out-of-state, the Warden is allowing them to visit with him during the morning and afternoon sessions. I hate being out here on the floor and having to share a toilet and sink with nineteen other guys. Last night, the guards kept awakening me with their walkie-talkies. I hope I get a cell when I’m moved. I count the apocryphal books as separate books; the regular Protestant canonical books, I do not. I include the latter in either the New Testament or Old Testament. I felt it necessary to, at least partially, explain why I rated Wisdom, but not Habakkuk and the First Epistle of John. I now begin to read Daniel (167-164 B.C., author unknown). It is one of my favorite books of the O.T. This will be the first time I’ve read chapters thirteen and fourteen. They are not included in the Protestant Bible because they are only found in the Greek Septuagint, not in the original Hebrew. I was just given a routine packet of information from the Office of the Ohio Public Defender. It says I have credit for 139 days in the county jail (which includes my short stay [before getting out on bond] in 1992). My first hearing date for the parole board is in August of 1998. I am not eligible for any shock or super-shock probation or shock parole. Five years incarcerated before I might get out! I must not despair. I had hoped I would only serve three-and-a-half or four. Sitting in the county jail for four months only put off my possibility for parole for four months. Four-and-a-half more years is a lifetime. If I begin my bachelor’s program in the fall, I should be done by the Fall of 1996. Then what? I must be strong. But will Pam be able to handle it? I can’t expect her to wait until late 1998. I was punished for standing up for my rights. If I would have pleaded to the lesser charge, I would have had to serve nowhere near so much time. But I would have lived in doubt; I would have always regretted that I didn’t fight it. Now I have fought it… and lost. My only hope lies in the appeal. But I doubt justice will be served. Prejudices in such a case are too strong, I believe. Unfortunately, Dude asked for his Bible back before I finished reading Daniel. Several fools were dicking off on the way back from lunch. The Deputy Warden witnessed their behavior and chewed the guard’s and sergeant’s asses. So we got ours chewed when we returned to the unit. I am depressed. I’ll wait to write more. I’m sending a kite to the public defender to get an appointment and see what information he can offer. I also added to S’s letter. I can’t see a clock from my cell. I am now in unit 9A, cell 213, top bunk. I’ve a little Black cellie who so far is pretty quiet. He’s in on a drug charge. We’ll go to commissary [for the first time] on Thursday and be able to use the phone tonight. I am very lonely and sad. I hope I get a letter from Pam tonight. I doubt I will, however, since I just received one yesterday. I can’t believe how overcrowded it is here. Where in 3B there were twenty people on the floor, in 9A there are eighty. I was fortunate enough to get a cell. My old cellie, Gary, is going nuts on the floor. I don’t know why we didn’t go to the non-smoking pod with the other two guys. I’ll send a kite to the Sgt. about it. Before chow, I lost a game of casino to my cellie. unhappy as me; but I think she is. I began writing a letter to Pam. My cellie has a New Testament which is translated into simple English by Julian G. Anderson. At least it’s something to read. However, I don’t like it for the same reason I don’t like Reader’s Digest‘s condensed books. Instead of simplifying books, we ought to educate their potential readers. Perhaps I judged this NT translation too harshly, due to my sour mood. But I still don’t like condensed books by Reader’s Digest. This smoke is choking me. This cell is so close; and I haven’t had to live with constant smoke for nearly five months. I received my permanent ID badge today. It has a wretched picture of me, my right thumbprint and signature, and my date of birth and number. Just posted today … written by Detroit poet Christina Brooks, a.k.a. Rune Warrior. Check it out! And if you were part of this very special event, please don’t be shy about sharing your impressions in the comment section there (I already did). Maybe we can make it into a sort of communal review, showing the Lix and Kix beast from every possible angle – though Chris has already done as good a job of that as one person can. Thank you, Chris! And thanks to everyone who made Lix and Kix IV at Cleveland’s 806 Wine and Martini Bar a thoroughly enjoyable experience. Since I finally located the mini (5″ x 8″) legal pad containing pages 340 through 360 of the journal I kept while behind bars, I suppose it’s time for another installment of my “Incarceration Chronicles” series. Bear in mind that though this was only my 11th day in the state prison, I’d actually been locked up for four months by this point, most of it at the county jail awaiting transfer to Lorain Correctional Institution. The county jail portion of my diary (handwritten pages 1 to 310) is not online – but will be eventually. My diary, presented here without editing, was not originally intended for public consumption. But as I write my memoirs I find it useful to post the old pages here on my blog, as your comments and questions help to dust off my memory (where necessary) and catalyze my writing. Bear in mind that to save paper and time, I tended not to repeat in my diary things I had already written in letters (and I saved carbon copies of every letter I wrote). So a lot of things that aren’t here will be in my book. I spent the morning trying to sleep, then reading from Gita. I told Mom yesterday that I’d probably get to use the phone this evening. However, it seems the c.o. is changing the program and will have us call this afternoon. That means I will probably miss Pam again. Damn it! Oh well… I can do nothing but accept what ever comes. I am disappointed that I was unable to reach anybody by phone this afternoon. I wish the guards would have stuck with the schedule. But at least – I hope – I’ll be able to see somebody this Wednesday. I just finished reading Bhagavad-gita again. I keep dwelling on my need to talk to Pam. This makes fifteen days since I’ve seen her. Wednesday will be the fourteenth day since our last phone conversation. It’s the longest I’ve ever gone without talking to her. With this changed address, I haven’t even gotten a letter from her (or anybody else). Man, I hope I get to commissary soon. I found and read an inmate manual today while waiting to use the phone. If I understand correctly, I am allowed to receive books and magazines by mail, if they come directly from a distributor or publisher. Now I return to the Our Daily Bread, lacking anything else to read. One more instance where the Bible seems to affirm the deity of Jesus is in the book of John (14:9). “He who has seen Me has seen the Father” (New King James Version). John seemed to be more confident of this than Matthew, Mark and Luke. Perhaps he was senile when he wrote his contribution to the “Word.” I know he was pretty old. I just finished reading the March/April/May issue of Our Daily Bread. I need books! I need books! I’d rather have good books than good looks. The other day, I gave that cigarette to some pathetic, friendless guy. Today, my generosity was returned eight-fold. While leaving chow, I passed Jerry Y[epko] coming in. When the guard wasn’t looking, he tossed me a package with eight cigarettes in it. Now I’ll certainly be able to get a book. I just added to Aunt Marlene’s letter and was notified that I will be moved today. I know not where yet. Most of our group was sent to regular housing today. Six of us at the end of the list had to wait until another day, probably tomorrow. For now, I’ve been moved next door, to Unit 3B, #301, top bunk. The 300’s are not in cells but on the floor. Fortunately, I was able to buy an almost-full mini (5″ x 8″) legal pad for two smokes before I moved. Still no luck in getting a book. Let my new life begin. [Editorial note: I wrote everything above in tiny print on the back of a prison visiting schedule (and called it journal page 339). I just wrote to S [Geri]. I hate being stuck out here all day long with no privacy. This pencil sharpener is murdering mine. Desperation move: I gave a guy three of the Buglar cigarettes for a piece of a KJV Bible. It goes from the beginning of Genesis to about chapter thirty-three of Job. Another guy had pity on me and let me use his complete NAB. The New American Bible is Catholic. I used to have one when I was in high school. I’m going to read the apocryphal books first. I have to return this one in the morning. Then I’ll start the KJV; my cellie’s using it now. A guy saw me with the Bible and struck up a conversation with my cellie and me. He had some interesting stories to tell about healers and whatever else. I dislike a lot about Christianity; but I’d much rather talk to him than most of the people here. At least we can have a semi-intelligent conversation. I was extremely glad to receive cards from Mom and Pam today. I just read a tract entitled “Transformed” by Paul J. Levin. I wish I could do something to take away Pam’s (and Mom’s) sadness. I’m finding it extremely difficult to write with all these people babbling. 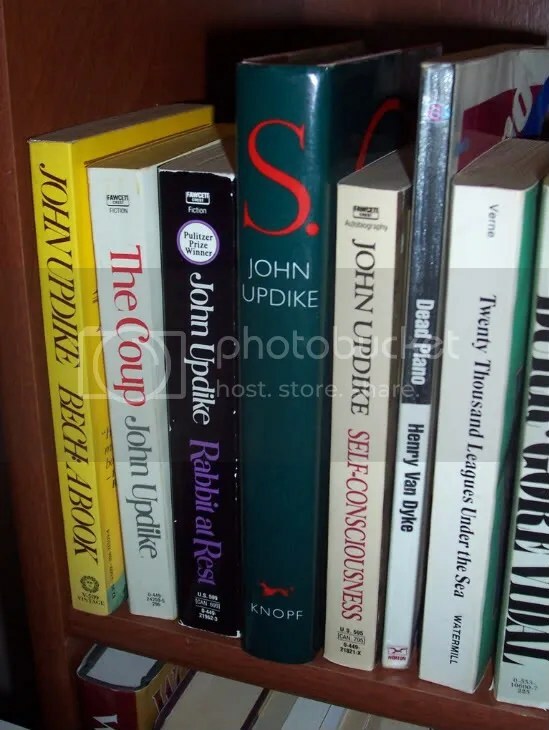 Here’s a photo of Updike books I took today in the non-cyber Jesus Crisis library. Rabbit at Rest indeed…. If you missed our fourth Lix and Kix at the 806 Wine and Martini Bar in Cleveland on Tuesday January 20th (Inauguration Day), no blog in the world is gonna give you an adequate idea of how cool it was. And I’m not just saying that because I was the event’s co-host (along with Dianne Borsenik). Good people, great poetry and a fantastic amount of fun…. I give hearty thanks to our excellent featured readers, C. Allen Rearick and Elise Geither. I can’t praise them enough! They’re not only great artists, but also fine folks. Thanks, too, to the other awesome friends and poets who came and showed their support (some drove over two hours to be there). Thanks to the new friends I met in person for the first time. Thanks to the fantastic open mic readers/performers – among them some super Lix and Kix virgins. And though I admit a bit of bias (I try to see through it), I have to say this was one of the most enjoyable nights of poetry I’ve ever experienced. I feel honored to have been a part of it. Often, however, the photos tell a better story than any words I can muster. So without further ado…. I highly recommend Elise Geither’s Horse Latitudes: Poetic Monologues for Women (from deep cleveland press) and C. Allen Rearick’s collection Through These Eyes (from Tainted Coffee Press). I’m very happy they agreed to be featured readers for Lix and Kix IV. Both were very good! But If you missed ’em you can see C. Allen Rearick (and several other fine poets, including Dianne Borsenik) at the March 14th As We Speak event he’s organized. For more information on plays and readings by Elise Geither, contact her at egeither@bw.edu. For more on the poetic doings of C.Allen Rearick, contact him at www.myspace.com/c_allen. See us every third Tuesday (7 p.m.) at the 806 Wine & Martini Bar, 806 Literary Rd. in Tremont (the artistic heart of Cleveland). P.S. Since someone’s sure to ask what I read… I performed three songs: Neil Young’s “After the Gold Rush,” my “The Picture of Dorian Blue” (from a 2000 Christmas musical I wrote/produced behind bars), and John Lennon’s “Imagine” (good songs, I hope, for the day Barack Obama became President of the United States – since I couldn’t learn David Bowie’s “Changes” in time). I also followed my new “tradition” of reading three poems: one of my own, one by a favorite dead poet, and one by a favorite living poet. For mine I chose Karma Souptra, since that’s one I didn’t read during my feature at Mac’s Backs earlier this month. I also read Sitting Outside by W.D. Snodgrass, who died earlier this month, and an untitled poem about Johnny Depp and Jesus from Alex Gildzen‘s excellent Outlaw Dreams collection [Green Panda Press, 2008]. Alex has lived in Santa Fe, New Mexico, for many years now, but will be returning to the Cleveland area in May for the Tres Versing the Panda poetry and music festival. See you next month at Lix and Kix! Thank you all! While waiting for my Lix and Kix IV photos to upload (which is taking way longer than expected), I decided to multi-task by responding to one of my many “tags” on Facebook. This tag by a fellow poet asked me and several other folks to answer the following 33 questions. I’m copying my responses here in the interest of having a quick and easy blog. Feel free to share your own answers on the comments if you’re so inclined. Or if you prefer, ridicule mine. I haven’t really watched TV sports in years – but if I had to pick something to watch right now, it would probably be Cavaliers basketball. I’m excited by the prospect of a Cleveland championship. Cherry Nehi – I wish they still made it. Yes – I tried Just for Men once in 2004, thought I looked ridiculous. Write, play piano and – if all else fails – yell! Depends on what age – teddy bear, Six Millian Dollar Man, chess set, record player…. Blueberries – as much as I love cherries, I prefer to go pitless. 19. Do you want your friends to tag you back? 21. Least likely to respond? One wife, three dogs, two computers and thousands of books. 24. What is in the bottom of your closet? Depends on the closet. In my bedroom closet, most of my shoes…. 25. Who is the friend you have had the longest that you are sending this to? Since I’m double posting this on my blog, and she subscribes to my blog via e-mail, I’d have to say Mom. Visited Mom, practiced on my guitar. 28. Plain, cheese or spicy hamburger? Right now I could go for garden burger… with cheese. Depends on the week – today Thursday’s looking pretty good. West Virginia till I was 3, and Ohio since. Probably pearls – I can’t see a diamond without remembering horror stories about the mines. What better way to celebrate inauguration day (or any day, for that matter) than with poetry? Tonight at the 806 Wine and Martini Bar in Tremont, Lix and Kix are proud to present poet/playwright Elise Geither and poet C. Allen Rearick as our featured readers/performers. Dianne Borsenik and I will be your hosts. And the 806 is renowned for having some of the finest drinks in Ohio. We will try to begin promptly at 7 p.m.
Elise Geither’s plays have been produced in NYC, Los Angeles and around California and Ohio. Her poems have appeared in a number of journals/zines, including Morpo, Big City Lit, Thunder Sandwich, Slant, and the Artful Dodge. She’s an instructor at Baldwin-Wallace College and working on her PhD. She’s also authored the must-read Horse Latitudes: Poetic Monologues for Women (deep cleveland press). C. Allen Rearick is an organizer of the recent Zygote in My City readings and upcoming As We Speak poetry event. He has read his work in countless places from New York to Missouri, and it has appeared in such online and print journals as: Remark, Zygote In My Coffee, Identity Theory, Mad Hatters’ Review, Poesy, Opium, Dogmatika and much more. His must-read chapbook, Through These Eyes, is available from Tainted Coffee Press. I hear tell folks are coming all the way from Toledo and Detroit for tonight’s Lix and Kix. Even President Obama is having poetry read at his inauguration today. But if you can’t be in DC for history, at least you can be at the 806 Wine and Martini Bar for some excellent Cleveland poetry – 7 p.m. at 806 Literary Road in the Tremont neighborhood. M.L. King Day and the most viewed Crisis Chronicles blog ever is revealed! First of all, Happy Martin Luther King, Jr. Day! To celebrate, I invite you to visit the Crisis Chronicles Online Library and watch his I Have a Dream speech, which I posted there on Election Day. The timing seems appropriate when you consider that tomorrow we will see a significant fulfillment of part of his dream with the inauguration of our first African-American United States president. A couple of weeks or so ago, I shared a listing of the most viewed entries in the Online Library. The list has changed a little since then, but that’s beside my point. At the time, several readers expressed curiosity about what my most viewed blogs might be as well. I avoided answering, and said only that my most popular Crisis Chronicles blog received close to 12,000 hits. Several folks tried unsuccessfully to guess what it was. But now seems like a good time to tell you. The number one most-viewed blog on this website since I created it slightly over a year ago is Happy Birthday, Dr. Martin Luther King, Jr.! (from 15 January 2008). It’s interesting that almost all the top ten most viewed entries on my blog are entries that feature little or no original content by me. Humbling actually…. But I can’t think of anyone deserving of more views (and listens) than Dr. King. Without his work, words, inspiration and sacrifices (but not only his), I daresay there would be no President Barack Obama tomorrow. Do we have great cause to celebrate? You betcha! Just goes to show… there are some dreams you can believe in. I wasn’t going to let anything prevent me from being present for my 2nd ever featured reading this past Wednesday – but the weather certainly tested that resolution. The approximately 25-mile trek from our home in Elyria to Mac’s Backs bookstore in Cleveland Heights (the site of the reading) took us nearly two hours. This is one time I was thankful for my wife’s SUV, because my little car probably would not have made it. We stayed between 20 and 40 miles per hour the whole way down Interstate 90 (the speed limit is 60-65). We passed several accidents along the way. And traffic was at close to a complete standstill on Carnegie Avenue. But we’d left quite early and were still able to make it to Mac’s with fifteen minutes to spare. I didn’t expect too many other people to attend – but some brave souls surprised me. Of course Mac’s Backs proprietor Suzanne DeGaetano was on hand. So were friends Dianne Borsenik, Jen Pezzo, Vertigo Xi’an Xavier, and a few others. We were especially happy to meet our online friend Sue Savickas for the first time in person there. The other featured reader that night was Jason Floyd Williams, author of Inheritance Tax [Interior Noise Press]. 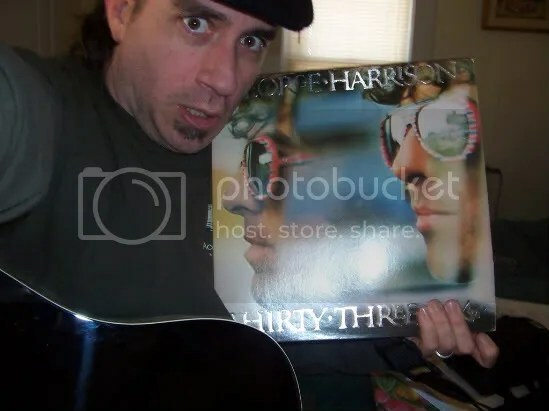 He and I have been MySpace friends for a few months, and I’d heard a lot of good things about him and liked the little of his work I’d read and heard online. But this was the first time we’d actually met and heard each other read in person. We decided to go back and forth with our poems, a few at a time, and it ended up working out pretty well that way. Our different styles and the way we were able to feed/bounce off of each others’ words and themes kept it interesting – and I was somewhat sad to see it end, although happy to experience the subsequent open mic, where Jen, Dianne, Suzanne, Peter Leon and a sign-language poet (whose name I wish I knew) shared a dynamic, interesting, inspiring mix of work. Mac’s is always one of my favorite places for poetry readings, and Wednesday was another great experience, well worth braving the elements. The place has so much history (30 years as a literary bastion in the Cleveland area) – and I was a combination of thrilled, proud and humbled to have the opportunity to be a featured poet where many legends have read before. I’m a bit stunned that they’re going to sell my Bloggerel chapbook there as well! Me, Geri (and Jason) ready to head home – photo by Sue Savickas. Visit Mac’s Backs at 1802 Coventry Road in Cleveland Heights, Ohio. They’re open from 10 to 9 on Monday thru Thursday, from 10 to 10 on Friday and Saturday, and from 11 to 8 on Sunday. They hold poetry readings the 2nd Wednesday of every month at 7 p.m., a poetry workshop every 3rd Friday at 7 p.m., and a host of other cool artistic events on various other days. February 11th, they will feature poet and actress Renee Matthews Jackson, who will be performing Women of Season (a poetic production with excerpts from the works of Ntozake Shange, Laini Mataka and other poets). For more information, check out their website at www.macsbacks.com or call them at 216-321-BOOK.